The chart above illustrates various Candlestick patterns from the S&P 500 Futures 610 tick chart. 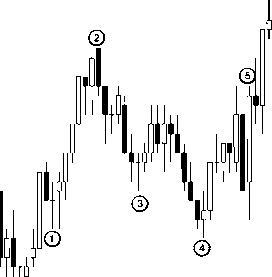 Various Candlestick patterns have been marked in the chart above and explained as follows: 1). 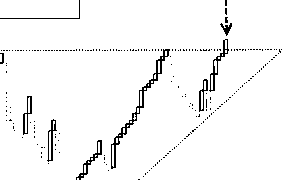 A Doji pattern to suggest indecision in the prior direction. 2). A Dark Cloud to signal a potential end of trend. (Also see Hammer pattern prior to the Dark Cloud). 3). Another Doji to signal indecision. 4). A Piercing line followed by a strong trend reversal bar. 5). A Bullish Engulfing pattern to confirm a strong trend ahead. 6). A Gravestone Doji. 7). A Doji bar to suggest an imminent trend reversal in the next few bars. 8). An inverted Hammer at the top to signal the end of uptrend and strong downtrend to follow. Three Line Price Break (3LPB) charts define the underlying trend and are considered as an adjunct to the candlestick charts. 3LPB charts display a series of vertical boxes or candles that are based on price changes. The 3LPB method entirely dispenses with the recording of the volume sales and time data on the X-Axis. The other major charting techniques like Point & Figure, Kagi and Renko charts also ignore the passage of time and volume. The 3LPB are always constructed based on closing prices. A basic understanding of 3LPB is when there are three white successive candles, the major trend is up, and when there are three successive black candles, the major trend is down. The major reversal signals (based on the 3LPB technique) are given when the shift lines, white to black or black to white are formed. After forming a confirmed trend of 3 white candles or 3 black candles, the reversal is only triggered if the current price is traded below the lowest of all prior three candles in case of a bullish trend reversal, or if the current price is traded above the highest of all prior three candles in case of the bearish reversal. The 3LPB charts below show major trend changes. A trend change confirmation is made when a reversal bar is formed. However, a trend confirmation bar could be late and a significant move to the upside or downside may have already happened. A solution for this problem could be an intra-day trading signal for confirmation of the trend. The 3LPB charts also use other indicators and pattern formations to indicate price trends. The best trade signals are generated when the market reverses near the key support and resistance levels. The chart above shows an example of a 3LPB pattern from the Russell 2000 E-Mini one-minute chart. Candle A shows a Three Line Price Break reversal to the upside from the previous trend as the price closed above the high of the three candles. A "long" entry is placed at 831 level. A stop order is placed at the low of this breakout candle at 830. Targets are either taken with a reversal candle or at a pre-set target limit. One of the best techniques to place a target is to take the length of the reversal bar and use 2 times the length of the bar as the target. At candle B, a 3-Bar reversal candle is formed to enter a "short" position below the low of candle B. A "stop" order is placed above the high of Candle B. A target of twice the length of the candle is placed below the entry level. The chart above shows a Three Line Price Break chart from the Russell Emini one-minute chart. The chart shows an ascending triangle pattern formation as the upper trend line was tested three times. The price closing outside the upper trend line signals a potential long trade. 1. Enter a "long" trade above the high of the breakout bar. 2. Place a "stop" order below the low of the breakout candle. 3. In an "Ascending triangle" pattern trade setup, the depth of the triangle is added to the breakout level for a target. I first read about the Market Structures concept from Dr. Ron Lockhart. Then I read more detailed Market Structures work from Michael Jardine's book, Fibonacci Trading. The Market Structure concept is simple, yet a very powerful structuring concept. Markets have structures and traders miss most cues as they are constantly hunting some pattern, momentum, oscillator or some Zen-type signals. Market Structure formation is a price phenomenon occurring at major turns. Prices start with a wave (lets say Up) and it ends at some point and then there is a down-wave, and it ends some time and then begins another up-wave. These wave formations start with the Market Structures. Market Structure Low (MSL) and Market Structure High (MSH) formation is continuous and is repetitive at every wave begin and at every wave end. Market Structures form in all markets, in all time-frames and in all instruments. They fail and re-fail, form and re-form. Market Structure is a concept pattern. It needs other indicators, support/resistance levels, triggers to confirm the theory and its works. 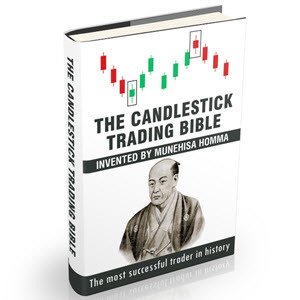 Market Structures are well explained with Candlestick charts. Market Structure Low (MSL) is explained with three candle pattern. A new low, lower low, higher low of CLOSE. Please see the word in BOLD, MSL is based on close values not lows or highs. A MSL based long is triggered when prices close above the highest close value. A stop is being placed below the low of the MSL to protect the trade. 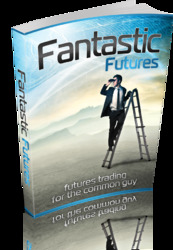 Get All The Support And Guidance You Need To Be A Success At Futures Trading!This Book Is One Of The Most Valuable Resources In The World When It Comes To Futures Trading For The Common Guy.